What are the best Stroller Travel Systems? Stroller travel systems are a must for newborn babies because it makes it easier for the parent to transport and move the baby around without constantly carrying and cradling, which may constantly wake the baby up and give strain to the parents’ arms. If you are not familiar with stroller travel system, this is a prepackaged set that contains a stroller, infant car seat, and car seat base. A stroller travel system allows the parent to save up money as they get two essential things in one and allow for a design and color coordination, which matters to both the budget and style conscious. 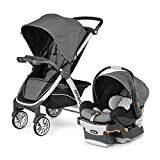 A travel system is best used for sleeping infants as the parent can simply transfer the seat from the stroller and onto the car seat base and vice versa without too much fuss. The seat often just snaps on the base and the stroller for added convenience. To help you find the best stroller travel system, read on. How to buy the best stroller travel system? Although it’s easy to pick a travel system, there are still some things that you need to consider in terms of you and your baby’s needs. After all, not all mother and child have the same preferences. Car Seat – When buying a stroller travel system, what you should pick first is the car seat. This is because strollers can easily roll onto different types of pavements, but not all car seats are compatible with the type of car you have. Check for the size (if it fits your car), for the ease of installation, and for the five-point safety harness. Car seats should have handles that let you take the baby out and carry it with ease. Most car seats already have this, so you shouldn’t worry about that. Look instead on the materials of the handle and make sure its sturdy. Although you won’t do a lot of carrying using it, you want to make sure that it won’t easily snap. Stroller – The stroller can be used on its own once your baby outgrows the car seat. But in the meantime, the stroller should be able to effectively hold the baby car seat once you lift it out of the car. Check for the mechanisms of the stroller and the car seat so you’ll know for sure that once the car seat has been placed onto the stroller, it won’t budge. Jogging Strollers – Not all stroller travel systems cater to the traditional ones. There are travel systems that come with jogging strollers for the parents on the go. 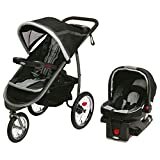 Jogging stroller travel systems are best used if you intend to take your run outside your neighborhood, otherwise, you can just get a traditional stroller travel system and buy an additional jogging stroller because it may be more cost-effective this way. Portability – It’s granted that the car seat is portable so you should also get an equally portable stroller. Find ones that can be folded easily and won’t bear much weight when carried. Jogging strollers are on the heavy side because of the large wheels, extra padded seats, and thick frame. If you’re looking for a lightweight stroller travel system that you can take anywhere with ease, consider getting umbrella strollers. They can be easily folded and are made of lightweight materials. Many of them can also be wheeled one-handed when folded. Also make sure that the folded stroller can fit in your car, otherwise it beats the purpose of the travel system. Key Takeaway: A stroller travel system is definitely the best one that will save you some cash because you’re paying for two items, rather than separately buying them. Consider the factors listed above before purchasing so you’re sure that you’re getting the most out of your hard-earned cash. What are the recommended stroller travel systems? We have listed below some products worth checking out. If you can, try the travel system first before purchasing. You want to try to work the mechanism for yourself to see if it is efficient for you. This stroller travel system is for joggers who want to tag their baby along. The jogger stroller comes with a Graco snugride infant car seat from 4 to 35 pounds. The stroller can be folded with one hand in only a matter of seconds. It features air-filled rubber tires with suspension for smooth ride on different terrains. The front wheel can be locked for added stability during fast jogs. Both the stroller and the car seat are thickly padded for your baby’s comfort. It is also multi-position reclining for peaceful and comfortable napping. This chicco stroller is made from lightweight materials, making it efficient for traveling. The stroller is equipped with a five-point safety harness, removable canopy with peek-a-boo, multi-position reclining seat, leg support, and all-wheel suspension. Accompanying the stroller is a KeyFit 30 infant car seat that accommodates 4 to 30 pounds. The car seat is thickly padded to give more support on the head, neck, back and bottom. It is also lined with energy absorbing foam and features an innovative LATCH management system. This travel system, featuring a lightweight motion stroller easily folds for storage in quick one hand fold and automatic frame lock. The accompanying car seat can be installed onto the car or the stroller with ease and features side impact protection and an energy absorbing foam liner. The stroller can hold the weight of a child up to 65 pounds while the infant car seat can hold up to 30 pounds. The BOB travel system is engineered well so that it rolls on different terrains with ease. The handle bar is also adjustable for easier maneuvering depending on your height. Stroller travel systems don’t come cheap; the good ones are priced above $200 and can easily go beyond $500. Therefore, you want to get the right one for you, to save you from any hassles. Stroller travel systems are very efficient because you’ll be able to get two travel necessities for your child.